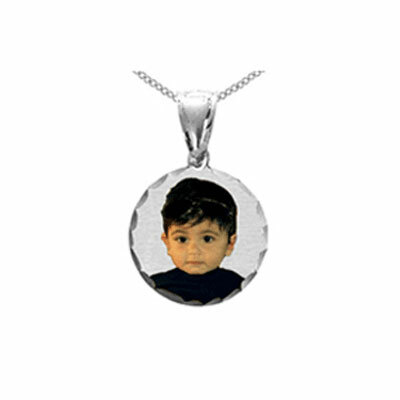 If you are looking for the best selection of photo pendants then you have come to the right place. Apples of Gold's Round Photo Pendant in Sterling Silver features a beautiful pendant and color photo of your choosing. The sterling silver is carved with a delicate and intricate design that accentuates the photo. The pendant is 5/8inch and is perfect for every day wear or for that special night on the town. Show off the important things in your life with this pendant set or say "I love you" to that special someone today! Get the beauty and brilliance of silver and the stunning design that makes Apples of Gold's jewelry better than the rest. See for yourself why this gorgeous Round Color Picture Jewelry Necklace in Sterling Silver is a must have for any fan of fine jewelry. We guarantee our Round Color Picture Jewelry Necklace in Sterling Silver to be high quality, authentic jewelry, as described above.